The detail just doesn’t look right to me. It is as if someone took a can of spray paint to a perfectly good gun! I’ve also never seen smoke coming out of a handgun that swirled around like that. Most likely the photographer has a cigarette habit. Bad texture on the barrel and the cylinder pin extension. It’s very likely an Airsoft revolver with the orange tip spray painted. I’ve got one I use as a movie prop. For photo shots, I prefer to use the real ones. It looks like the shell ejector rod is directly below the barrel. 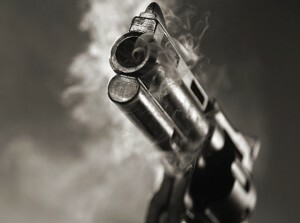 In a real single action revolver, it would be off to one side. I dunno; videos on youtube of people firing absurd numbers of rounds through kalashnikovs look similar once the handguard starts to smoke. Some really weird shaping going on there, though.